Price: £1.70 (incl VAT) Sorry, this item is currently unavailable. Click here to receive notification when this product comes back into stock. Reactions to Food and Medicines. Direction for Use: For Oral use only. 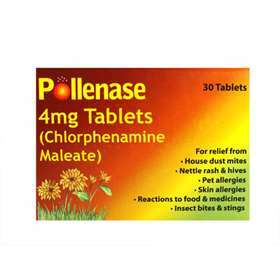 Chloraphenamine tablets should be taken orally with a drink of water. Adults and Children aged 12 years and over One tablet every 4 to 6 hours. Maximum daily dose: 6 tablets (24mg) in any 24 hour period. Children Aged 6 to 12 years Half a tablet every 4 to 6 hours. Maximum daily dose: 6 half tablets (12mg) in any 24 hour period. Cautions and Warnings: Not to be used by children under 6 years. Keep out of the sight and reach of children. If symptoms persist please seek consultation with your Doctor. Do not use if you are pregnant or breast feeding. Consult your Doctor if you take other medications. These tablets may cause drowsiness. Avoid alcoholic drink. Ingredients: Each Tablet contains 4mg Chloraphenamine Maleate, and lactose monohydrate. Product code: 2766483 Price: £1.70 (incl VAT) Sorry, this item is currently unavailable. Click here to receive notification when this product comes back into stock.